During the warm months of the year in the Southwest, colorful and graceful Painted Damsels (Hesperagrion heterodoxum) can be seen darting about and resting on slender reeds and tall grasses in lush riparian areas. The distinctive male Painted Damsels are mostly brilliant turquoise blue and black with a red-tipped abdomen and red spots behind the eyes. The females are turquoise blue, green, and black. Immature Painted Damsels are also colorful, but their colors differ greatly from those of the adults. 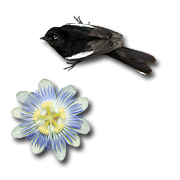 Immature males are mostly scarlet-orange and black with red eye-spots, while the immature females are mostly orange. Although Painted Damsels and other damselflies (Suborder Zygoptera) resemble small dragonflies (Suborder Anisoptera), they can easily be distinguished because damselflies typically hold their wings parallel to the body when resting instead of perpendicular like dragonflies. 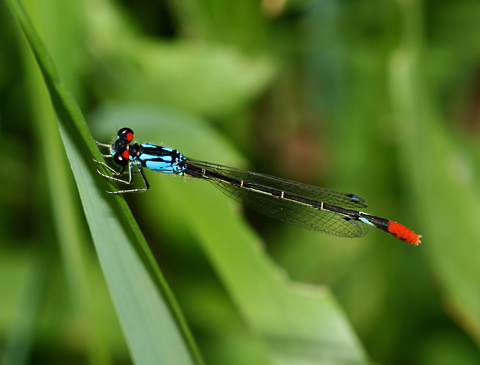 Like dragonflies, adult damselflies capture mosquitoes and other small flying insects. Damselfly nymphs (larvae) are aquatic and feed on aquatic invertebrates like mosquito larvae. Since both the adults and the nymphs are mosquito predators, colorful damselflies like this one are not just pretty, they are actually quite beneficial to have around.